Who is this mysterious Brahman? Who is this Being, whom we call God, who goes by different names, who is described so graciously in the Upanishads and extolled for centuries by seers and sages in the sacred land of the Vedas? Who is HE to attain whom people renounce everything, prepare themselves for hardships, risk everything and pursue Him day and night? In His thought, thoughts disappear, the mind subsides into stillness, and all boundaries disappear. In His pursuit, all pursuits come to an end. Seeking Him, one leaves behind all seeking. Who is this Great Being, whom even gods find difficult to explain? Beyond darkness and light, beyond all diversity and visibility, beyond all qualities and quarters, beyond all activity and forms, beyond all imagination and vision, beyond the silence of all silences, beyond life and death, is Brahman, whom none can explain in human language to our complete satisfaction. When you find Him, you do not find yourself. When you are with Him, you are without Him. When you see Him, you do not see anything else. The mystics find him, yet do not know him. He is known to the unknown, and unknown to the known. Your knowledge does not help you to reach there. Neither your wealth nor your thoughts. The entrance to the world of Brahman is right within you, but the veil of ignorance which stands between Him and you is difficult to pierce. Occasionally one may get a glimpse of Him by chance, as Indra, Vayu and Agni had. He appears like a lightning, in a flash, in the darkness of your mind and leaves you wondering what you just saw. It was how the teacher of Kena Upanishad described his vision of him. Who can really know Him with their limited consciousness? Who can fathom that mystery and yet return to tell the story of his encounter? How can a part know the whole, unless it becomes the whole? When the part becomes the whole, does it not cease to be a part? This is the problem of Knowing Brahman. When you do not know Brahman, you cannot be Brahman. When you know Brahman, you cease to be the person you are. Brahman, is the very Self, the indivisible, pure, "I" ness, which is everywhere, in everything and around everything. There is no duality, division or dichotomy in Brahman. Brahman is one Supreme endless unitary feeling of "I" ness. That "I"ness is pure, immutable, indivisible and universal in Brahman, but manifests in the field of Nature as selfishness and egoism. In the supreme consciousness of Brahman, there is no “you” or otherness. In him, "you" are lost because the notion of "you" remains absent forever. When you achieve union with Brahman (brahmasparsha), you cannot explain your experience (brahmanubhuthi) to others, because in him there is no experience of experience. In that state, there is no objectivity, or the duality of subject and object. Everything is part of one, endless, vast, immeasurable Self, in which at the highest level there is One only, without another. It is consciousness without distinction, awareness without duality, and absorption without the feeling of separation. Everything is Self, the one, indistinguishable "I-am-ness". In that ocean of supreme consciousness, there is no "me" or "mine" either, because egoism and possessiveness, which are part of the egoistic individuality, are completely absent there. We possess things or fall in love with them because the Brahman (Self) in us is attracted to the Brahman in them. In worldly life, we know no other way to achieve union with Brahman. Due to Maya, the soul’s aspiration to be with Brahman becomes sublimated into endless desires for things and possessions in the field of Nature. By seeking things and having them we want to overcome the feeling of separation from Brahman, which is created by our experience of duality and spatial distance. We indulge in sense-gratification and desire-ridden actions because we want to overcome the feeling of separation and incompleteness, by filling our lives with numerous things. In Brahman, there is no object and subject, no experience and experiencer, and no knower and the known. Everything is one endless indistinguishable "I" ness. Brahman is "I am" and "I am" is the Eternal Reality. "I am", the non-possessive, non-egoistic, non-dualistic "I am" is the Truth, the Whole Truth, the Purpose and the Goal of all life that seeks and extinguishes itself in seeking. 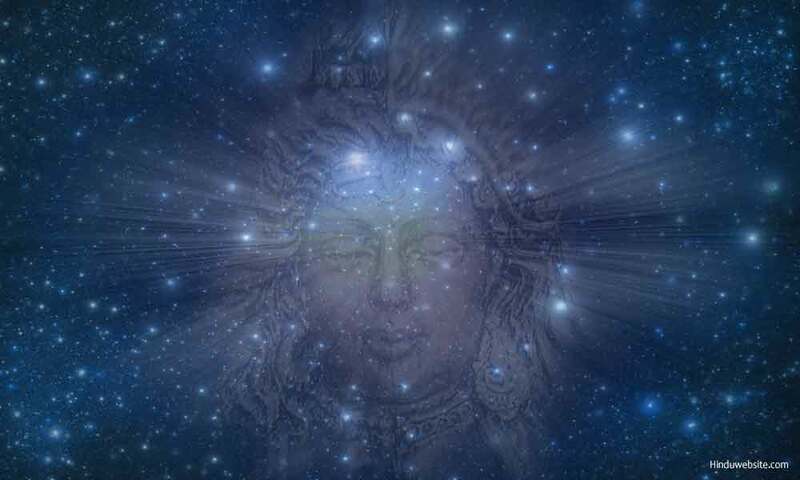 In the stillness of Timelessness and immeasurable transcendence, Brahman is "I am Who I am." He is the all-pervading “I-am-ness,” who appears to others in whatever way they approach. Like the clouds in the sky, he appears differently to different people according to their worldly desires, aspiration, expectation, knowledge and awareness. The wise ones, however, look beyond the clouds at the sky and know that he is the infinite, unfathomable Self and beyond names and forms. Experience of this awareness of Brahman as the immeasurable, indescribable, indestructible and formless Self is what we call Self-Realization or the highest state of Samadhi. When we realize that there is nothing else in this vast universe, except the Eternal Self, who is also the inner Self of all, we reach the end of our long journey in the world of death-ridden, ephemeral forms. That journey begins when we are separated from Brahman and ends when we become One with him. All craving, competition, striving, envy, and comparison arise because of the absence of this awareness. Our hidden yearning for Brahman and our determination to become complete and perfect and return to him become manifest in our wakeful consciousness as hunger and thirst for the things of Brahman, which the Upanishads describe as his food or materiality. When a seeker realizes that he is everything, and the things that he seeks and owns are also part of the same reality that pervades all, where is the need for him to seek them or compete with others to own them? The soul does not need things because it does not depend upon them. It is the body and the individuality, which surround the soul and create that confusion and the sense of dependence. True renunciation comes out of the awareness that you are the infinite, all-pervading, immutable, eternal Self and you are the essence of all things here and hereafter. Without that awareness and the knowledge of oneness, renunciation itself becomes a striving, and in that striving, lurk the shadows of duality, egoism, selfish intent, fear, anger, envy, lust, pride and the delusion of ownership and doership. The following story from a Sufi teaching amply illustrates the point. It conveys the same message, but in the language of duality, with God as the other being rather than oneself. However, the message is the same. There is no otherness or duality in God. He is everything, without a second. For him all this is God. A man once knocked on the door of God’s house. "Who's is there?" asked God from within. "It's me," said the man. "Go away then. There is no room for two," said God. The man departed and wandered in the arid desert until he realized his error. Returning to the door, he knocked again. "Who's is there?" asked God as before. "Then come in," God replied.